Share "Aquarium Setup Tricks/ Design Ideas"
Building an aquarium can be one the best parts for enthusiasts who keep fish as pets. For some people its call aquascaping because you are literally scaping out an aquarium environment for your fish. Ultimately, the better environment you build with consideration to live plants, rocks, gravel, and adequate hiding places, the healthier your fish will be. Follow this article for aquarium setup tricks and design ideas. When it comes to setting up your aquarium have a good idea of the size, dimensions, and type of fish that are going in the tank. Make sure to understand the needs and behaviors of your fish as your aquarium will need to be equipped to provide the right amount of space and features that best fit their needs. For example if there are bottom feeders in your tank, you will need an open landscape so that they can feed off what’s left on the floor of the aquarium. Other good tricks for setting up an aquarium are using backgrounds. Backgrounds are easy and affordable. They can be used to provide a simple illustrative background or even a solid color to create a uniform contrast across the back of the tank to help highlight the fish. It’s also good if you have a color of paint on the wall in your home that doesn’t quite add to the appearance of your tank. To add even more detail and a natural food source, add live plants. Live plants not only add to your décor, but also can help create a natural ecosystem for your tank giving your fish a healthier environment to grow and thrive. Live plants provide food, shelter, and oxygen while absorbing the carbon dioxide and ammonia that is generated from your fish. This will contribute to the quality of the water and overall filtration of the tank. Additionally, while choosing plants there are many colors and options to choose from. Keep in mind live plants require care and a good substrate to grow in. If you’re using live plants, you may want to avoid using giant rocks and opt for smaller gravel and laterite. Gravel can also come in different sizes, colors, and styles. For those fish that require sandy floors there’s also sand like substrate that can be used. Wash all natural objects before adding them to the water. Never hesitate to think outside the box when decorating your tank. Don’t shy away from going the distance and taking your tank to a new level with themes like a Buddhist temple, Egyptian pyramids, and outer space. Some of these items can be grabbed from your local pet store while others may require a trip to a craft or toy store. As long as it’s safe for your fish, it’s ok to include it in the tank along with any of their substrates, plants, and decorations. Your fish tank is your canvas. Think about it as if you’re building a museum that is not only stimulating to the appearance of your home, but also beneficial to the health of your fish. Don’t hesitate to read fish magazines or talk to your local fish store about potential options or concerns. 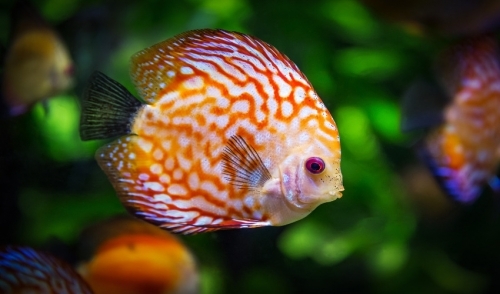 Keep these tricks and ideas in mind when aquascaping your next aquarium.